Justin Spittler: Nick, your advisory is called Crisis Investing. Could you explain what “crisis investing” is? Nick Giambruno: Crisis investing is basically buying elite companies in beaten-up countries or industries. When there’s a crisis, most people only see danger. But it’s actually an opportunity. A crisis often allows you to buy a dollar’s worth of assets for a dime… or less. 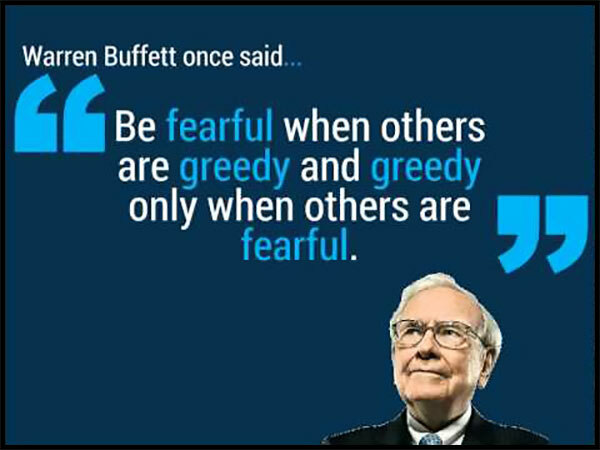 Many of the world’s greatest investors have made their fortunes this way… but anyone can do it. You don’t need be rich or well-connected. You don’t even need to travel to do it. In fact, if you have a regular brokerage account—and the courage to buy when others are fearful—you’re all set. The courage part is key. You can’t be a successful crisis investor if you’re not willing to go against the crowd. These statements perfectly capture the essence of crisis investing. Crisis investing is how these investors became some of the richest men to ever walk the earth. Tonight, the Legends of Finance Summit will have its World Premiere. 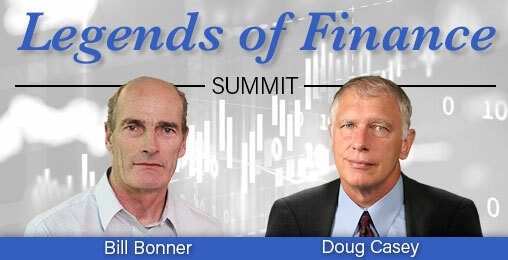 The story behind that name is simple – because renowned contrarian Bill Bonner will join legendary speculator Doug Casey for their first ever online Summit. That's why this premiere event is the biggest – and most anticipated – in the history of our research firm. And it's unprecedented in yet another way – because Chris Mayer and Nick Giambruno will also discuss 6 urgent ways to profit from Bill's “Trade of the Century” concept. Justin Spittler: Fascinating. What drew you to this unconventional strategy? Nick Giambruno: I’m a contrarian by nature. I zig when others zag. So naturally, I buy assets most people hate. Some of my close friends and family think I’m crazy for doing this… but that usually means I’m on to something. After all, it wouldn’t be crisis investing if I were going with the crowd. I was also inspired by Doug Casey. Doug is one of the world’s most successful crisis investors. He literally wrote the book on it. His book, Crisis Investing, was a New York Times bestseller for 34 weeks. He has also hit numerous “home runs” investing in crisis markets. Doug is my friend and mentor. Over the years, he’s helped me hone this profitable investing strategy. The name of my advisory, Crisis Investing, is a nod to Doug and the roots of Casey Research. Justin Spittler: It pays to learn from the best. You often call crisis investing “the most powerful wealth-building secret in investing.” Can you explain why? Nick Giambruno: Because crisis investing can allow you to make five or 10 times your money on safe investments. It’s somewhat counterintuitive. Most folks think you need to take big risks to make big returns. I see things differently. I think risk is largely a function of price. The higher the price, the riskier the asset. Right now, US stocks are trading near all-time highs. I consider them very risky. Bonds are even riskier. And real estate in places like Vancouver and London are in a super bubble. If an asset is really expensive, it usually means you’re late to the party. You should avoid expensive stuff if you want big gains. I prefer situations where everyone else has thrown in the towel… where the sellers are begging for a buyer. That’s when you can buy high-quality companies dirt cheap. It’s low risk, high reward. What could be better? The best investors in the world understand you make a lot of money buying cheap assets, not expensive ones. Take Templeton. He’s considered one of the greatest stock pickers of the last century. In 1939, he made a fortune betting against the crowd. At the time, millions of Americans were in poverty due to the Great Depression. Nazi Germany had just invaded Poland to kick off World War II. There was an incredible amount of fear in the world. Templeton, then just a recent college grad, saw an opportunity. He invested $10,000, the equivalent of $167,000 today, in US stocks. Justin Spittler: That’s a great example. Let’s turn to the things you look for in a good crisis investment. Anything in particular? Nick Giambruno: Ideally, I want to buy at the moment of maximum pessimism. Now, it’s impossible to identify exact bottoms… but there are ways to tell if a market is near a bottom. That’s good enough to make you a lot of money. One thing I look for is negative investor sentiment. The mass media can be a big help here. I steer clear of anything the financial media is in love with. On the other hand, scary headlines are often a clue that crisis bargains are available. If a country or industry is getting nothing but bad press, it’s worth a look. It’s even better when a crisis makes the front page of world newspapers. That means most investors have given up. You can make a fortune buying these hated markets. Justin Spittler: What else do you look for? You see, in a crisis, all stocks plunge. This gives you the chance to buy sound, profitable, and well-run businesses for next to nothing. Specifically, I look for markets that are at least 66% cheaper than their historical average. Most importantly, I look at dividends. Without question, dividends are the best single indicator of true value. Earnings can be unreliable. Flexible accounting rules allow companies to stretch the truth. The right fictions can easily pump up a company’s earnings. Dividends, on the other hand, are actual cash payments landing in your pocket… and you can’t fake that. They are real, and nothing is easier to measure. Double-digit dividend yields in quality companies are a sign that sellers have panicked. Plus, it’s nice to collect a fat dividend check from a quality company while you wait for a crisis market to rebound. It’s astounding what you can get in dividends alone when a market nears its bottom. Many people don’t realize this. Nick Giambruno’s Note: Tonight, join me at the Legends of Finance Summit at 8 p.m. ET. Doug and I will discuss our most profitable crisis investments… and show you how to apply those same strategies to today’s markets. You can join us for this historic event right from your home computer. The best part? It’s free. Reserve your spot right here. 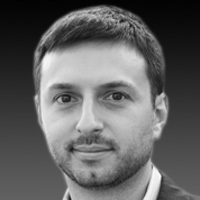 Nick is Doug Casey's globetrotting companion and is the Senior Editor of Casey Research's International Man. He writes about economics, offshore banking, second passports, value investing in crisis markets, geopolitics, and surviving a financial collapse, among other topics. In short, Nick's work helps people make the most of their personal freedom and financial opportunity around the world. To get his free video crash course, click here.